Obama now has an opportunity to commemorate his victims by releasing the still-secret documents that hold the Chilean dictator accountable. January 1987 State Department memo on Letelier to the American consulate in Rio. On the evening of January 21, 1987, the CIA’s deputy director for covert operations, Clair George, sent a secure pouch to the State Department filled with “top secret” intelligence cables from the agency’s station in Chile. The reports contained details from “extremely sensitive informants” on “the cover up directed by General Pinochet” of the September 21, 1976, assassination of former Chilean ambassador Orlando Letelier and his 25-year-old colleague, Ronni Moffitt, in Washington, DC. 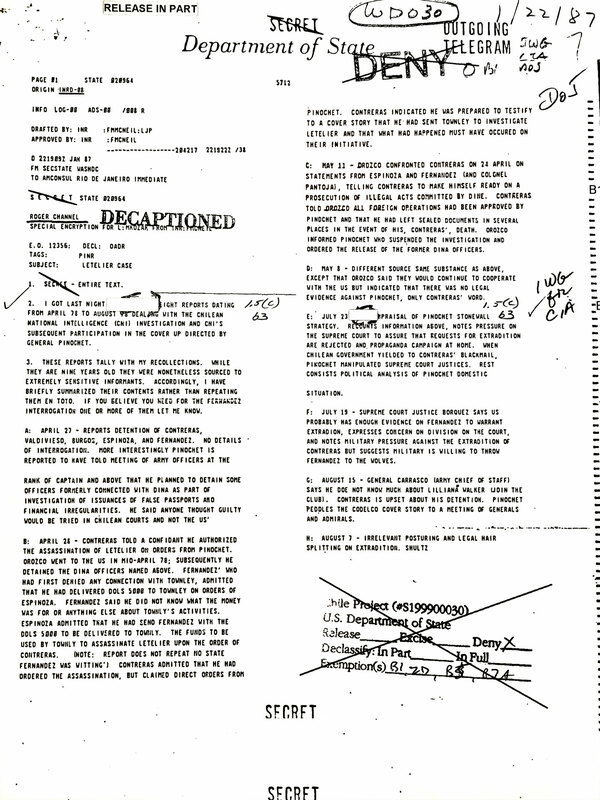 The documents were intended to help the State Department prepare a debriefing of Armando Fernández Larios, one of the officers of the Chilean secret police, or DINA, who had been sent to Washington to conduct surveillance on Letelier before his assassination, and who now wanted to confess and come to the United States. The CIA cables were so sensitive, according to Francis McNeil, the State Department official who received them, that “the CIA asked that they be summarized” rather than forwarded to Brazil, where the debriefing was scheduled to take place. Shultz’s dramatic memo to Reagan was among the more than 280 documents declassified by the Obama administration last October as a special diplomatic gesture to the Chilean government of President Michelle Bachelet. Forty years after this act of state-sponsored terrorism in the streets of Washington, the historiography had finally, if not fully, arrived at Pinochet’s doorstep. Washington officials, along with members of Letelier’s family and friends, had always assumed that Pinochet was the mastermind of this atrocity. “There was no way [DINA chief Manuel] Contreras could have ordered this without Pinochet’s approval,” McNeil recalls. In 1978, as the United States began pushing for the extradition of Contreras, his deputy Pedro Espinoza, and Fernández Larios, the CIA station in Chile began sending detailed intelligence on Pinochet’s personal efforts to block any investigation or extradition. In a June 23, 1978, report on Pinochet’s “strategy” with respect to the Letelier case, the CIA noted that the dictator would seek to “protect Manuel Contreras from successful prosecution,” “stonewall further requests from the US government,” and “continue to ‘lobby’ [Chilean] Supreme Court Justices” to reject all requests for extradition. After Fernández Larios was spirited out of Chile by US officials, they learned that Pinochet had personally ordered him to stay silent and remain in the country. Yet neither Jimmy Carter, Ronald Reagan, nor George H.W. Bush ever moved to formally investigate and indict Pinochet. Only after the former dictator was detained in London in 1998 under the European Anti-Terrorism Convention did the Clinton White House decide to open an official investigation. In April and May of 2000, a team of FBI, Justice Department, and State Department investigators and lawyers traveled to Chile to gather evidence. The FBI concluded there was enough to warrant an indictment, but the case was never pursued by the incoming administration of George W. Bush—even as the fight against international terrorism came to define his presidential tenure. In lieu of the now-impossible prosecution of Pinochet, who died in 2006, the historical record is the only venue left in which to indict and judge him. But that record remains incomplete. The CIA still refuses to declassify its 1987 intelligence summary on Pinochet’s role. Nor have the FBI recommendations and the paper trail of evidence generated by the Clinton-era investigation been released. As family and friends, along with Chilean President Bachelet, gather at the site of the murders 40 long years later, the Obama administration also has the opportunity to commemorate Letelier and Moffitt—by releasing the still-secret documents that hold accountable those responsible for their murders.